GE2015: What Kind of Government Do You Want and How Do You Vote for It? This looks like how things are shaping up for the Singapore General Election 2015. What are your thoughts on this? (1) I do believe that the Worker’s Party (WP) will be able to win at least 2 GRCs, maybe 3, and 2 SMCs (their current ones) and maybe 1 more. 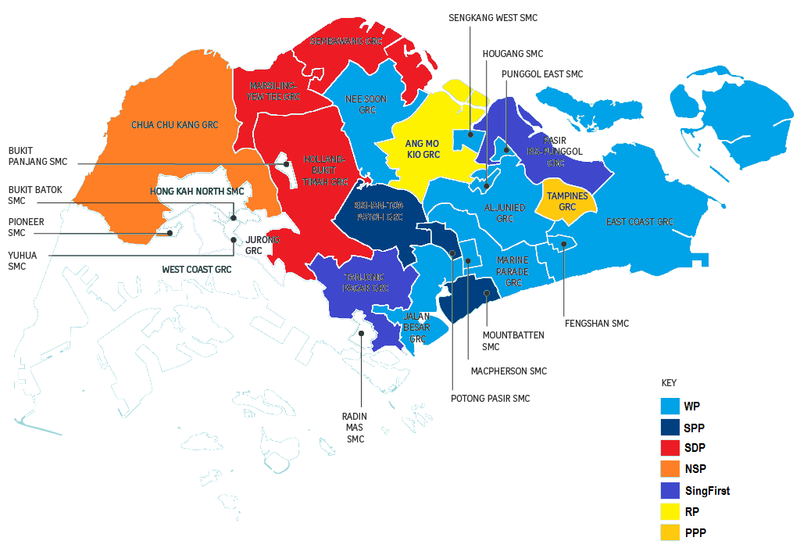 (2) I do believe that the Singapore Democratic Party (SDP) can win at least 1 GRC, maybe 2. I look forward to Dr Chee Soon Juan running again, with his A Team, including Paul Tambyah. The SDP was the fastest improving opposition party at the last election. (3) The Singapore People’s Party (SPP), which is under Mr Chiam See Tong, has a chance of winning 1 GRC and either one or both the SMCs that it will be contesting, with Ms Lina Chiam in Potong Pasir and Ms Jeannette Chong-Aruldoss in Mountbatten. (4) With Hazel Poa back as Acting Secretary-General, I do think that if the National Solidarity Party (NSP) concentrates their efforts in the Choa Chu Kang GRC, they have a chance at winning it. The PAP also seems to take Steve Chia seriously, which means they know he has a good chance at the Pioneer SMC. (5) SingFirst, with Tan Jee Say and Ang Yong Guan as the leads, seem to be a formidable pair. I would not be surprised if they would be able to win a GRC, with a good team. Would Tanjong Pagar or Pasir Ris-Punggol give them a better chance? (6) The Reform Party (RP)’s Kenneth Jeyaretnam is respected among many Singaporeans as being a strong economist. The Reform Party plans to run in a few GRCs and SMCs. Where do you think would give Kenneth a good chance? Will standing in the Ang Mo Kio GRC against Prime Minister Lee Hsien Loong be a good idea? 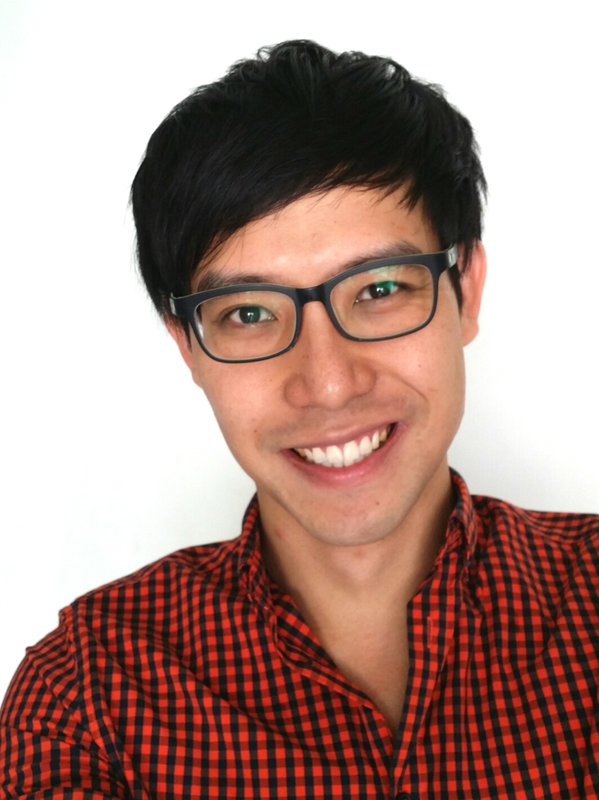 Or should Kenneth go for a single seat ward in the Radin Mas SMC? (7) The People’s Power Party (PPP) is a new party started by opposition veteran Goh Meng Seng. He ran in the Tampines GRC at the last election. Will he have another go at Tampines again? I have left out the Singapore Democratic Alliance (SDA) and the Democratic Progressive Party (DPP) because I have written them off, SDA for obvious reasons and DPP because it is obviously a mole party sent to attack the SPP. And let’s be quite clear here. 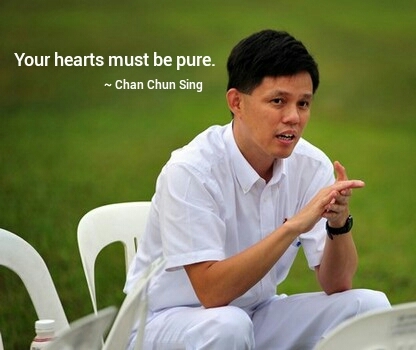 The PAP will now go on their propaganda and rhetoric, as Chan Chun Sing has dared say, that “your hearts must be pure”. But you can be sure that at the back, the PAP thinks quite differently and has already planned how they want to run, and even how to smear the opposition. As I have shown you, the PAP has changed the boundaries also according to which areas they want to develop for themselves, for their businesses, in future. So, right from the start, the changing of the boundaries is clearly not in the interests of Singaporeans or the residents, but really about where the PAP wants to give the best deal to itself. So, it’s not a fight about who will take care of the residents better. The PAP does not think like this and it would be naive for us to think like this, or vote like this. In other words, it is not a fair fight right from the start, so Singaporeans, we have to play smart. Simply put, Singapore is a small country. We are voting for a government which will implement policies to protect Singaporeans, or in other words, to set things right. There have been too many things under the PAP which have gone wrong – depressed wages of Singaporeans, too expensive the cost of living, unaffordable HDB flats, flats with falling pieces and concrete slabs falling off buildings, train breakdowns, healthcare that is so expensive that Singaporeans have to choose to die, $400 million given by the PAP to sponsor foreign students to study in Singapore but Singaporeans who have to pay the most expensive university tuition fees in the world, and of course CPF interest rates which are so low, and a PAP which takes our CPF to earn but not return our money, so much so that elderly Singaporeans have to work until their deaths – all these have caused the lives of Singaporeans to worsen over the past one to two decades. So what we really need in Singapore this time round is a new government that will take care of and protect Singaporeans, by implementing new policies to do so. And what are these new policies? The opposition parties have already talked about them – minimum wage to increase the wages of low- and middle-income Singaporeans, unemployment benefits to protect Singaporeans who lose their jobs, cheaper (not just “affordable”) housing, free education from childcare to university, healthcare subsidies to increase enormously so and even a cap so that Singaporeans don’t have to pay over a certain amount for healthcare, and an old-age pension fund alongside the CPF to fund the retirement of elderly Singaporeans. There are more, of course, do go to these political parties’ websites or their Facebook pages to read more about them. Of course, the PAP keeps threatening Singaporeans that to do all of the above, they would have to increase tax. This is not true, as several of the opposition parties have shown and calculated. First, the government has $20 billion to $30 billion in surplus every year, which the PAP does not declare to Singaporeans. This is more than enough to cover for the better policies proposed by the opposition. Second, the government collects about 8 times more indirect tax and CPF from Singaporeans, as compared with personal income tax. No other developed country collects so much more money over personal income tax, which means there are billions more in excess that can be used. Third, Singaporeans are made to pay Medisave and MediShield but do you know that we are only allowed to use a very small percentage of these every year while the rest go into surplus which the PAP takes to invest and earn? Clearly, there is a lot of money, and not just a lot of money, but a lot of money that the PAP does not want to give back to Singaporeans. But is the PAP serving itself or should a government serve the people? Well, it looks like the PAP has gotten its priorities wrong. Too many years in government has taught the PAP not only to be complacent but to take Singaporeans for granted. The PAP actually believes that they can keep taking your money to use and earn and you won’t make a single noise about it. Well, we proved them wrong with #ReturnOurCPF and now we are going to prove them wrong with the coming general election, widely believed would be held on 12 September 2015. How Do We Vote Strategically for A New Government? I have read comments online about how some people only want one, two or three opposition parties to contest because they do not want three-corner fights. Let’s take a look at the numbers first, and the party’s priorities before we worry over this. First, all the political parties do not have enough members to run in all the constituencies. Even the PAP is grappling at straws and have to move even the “Always Here for You” Desmond Choo out from the Hougang SMC to contest in the Tampines GRC (so that he’s no longer here for you) and the so-called “Son of Punggol” Koh Poh Koon out from the Punggol East SMC into the Ang Mo Kio GRC (so he;s now a deserter of Punggol). So, the PAP is desperate as well. Second, the main three parties – and I will put them to be WP, SPP and SDP – have their priority areas, WP in the East, SPP in the central area and SDP is the Northwest, so this still leaves other seats that need to be contested. As such these are where the other parties come in. I personally have confidence in WP, SPP and SDP in winning some seats each at the next election. For the other parties, I believe that it would be wise for them to consolidate an A Team each, or even a B Team, to run in their own stronghold(s), to win them. There will be a good chance that if they do so, they can each win a GRC. Ironically, even though the GRC was created by the PAP to help themselves win, the GRC system is now proving to be the Achilles heel for them, as the Worker’s Party has shown the PAP in Aljunied GRC. So it is time for the rest of Singaporeans to show the PAP as well, that we mean business. If you are not going to protect Singaporeans and you are going to take us for granted, and if you keep stabbing Singaporeans in the back, then PAP, out you go. Very simply, this next coming election, Singaporeans have to vote strategically. Really, it is not about our own feelings or our own likes and dislikes over certain candidates. What will these do for Singapore and Singaporeans? How will our personal liking for someone help to change Singapore? I think, let’s be quite honest about the situation in Singapore. We know that things are getting worse. We know we are worried. Of course, the PAP wants to tell you that without the PAP, Singapore will collapse. As I have said many times, Singapore is actually being run by the civil service, Singapore companies, civil society etc. In short, Singapore is actually being run by you, so unless all 3.5 million Singaporeans collapse at the same time, and unless all 5.3 million people in Singapore collapse at the same time, Singapore is not going to collapse. Just changing 90 people in government will not cause Singapore to change drastically. What will happen though is that the PAP will try to sabotage Singapore. This is when we need to think about what we want in Singapore and how we need to get there. Three Scenarios: How Do You Want the Next Government to Look Like? So, what is the next option? The next option is to let the opposition form a government on a slim majority, with the opposition getting slightly more than 50% of the votes. And what then will happen? The opposition, which by then, will be the government, can try to push through policies, as outlined above, to protect Singaporeans. But the PAP can keep blocking the new government in parliament. Then, for the next 5 years, you will have the PAP keep blocking policies that can protect Singaporeans. 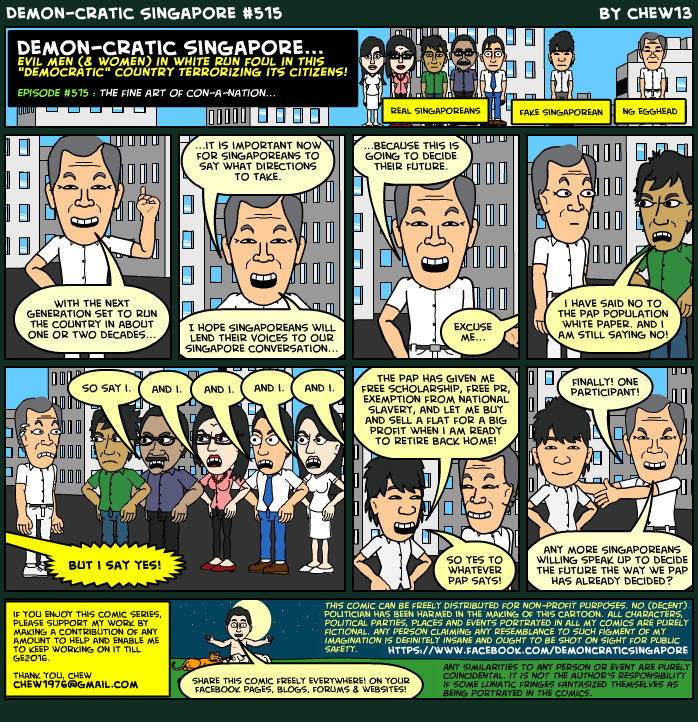 In the first scenario, you will have a situation where the PAP will find ways to change policies to hurt Singaporeans, without going through parliament. In the second scenario, you will have a situation where the PAP will keep blocking policies that a new government will want to propose to protect Singaporeans. So what’s the third scenario? Well, the third is where the opposition wins two-thirds of the seats and form a majority government where they would be able to implement policies without the PAP’s blockage. When that happens, the new government will be able to implement policies to protect Singaporeans. So, I have shown you three scenarios. What will you choose? I think, at this point, it is time we stop and think for ourselves, what it is we really want. Do we want policies to protect Singaporeans or not? This is a very simple question. We have to stop going through the back and fro, and first saying that we want things to change but then saying things cannot change too much, and we should still have PAP. So, let’s stop for a moment and think – let’s be quite honest, the PAP hasn’t been willing to implement policies to protect Singaporeans for the past decade, or two. It is only in the last few weeks that the PAP suddenly say it will do this, it will do that. But we have been here before. This happened in 2011, it happened in 2006 and in 2001. The PAP can promise you the sky just before the election, and then it will turn its back on you after the election. We have been through this over and over again, and we have been stabbed in the back by the PAP over and over again. Even for the boy who cried wolf, the villagers knew not to trust the boy after the second time. So, what are you waiting for? Another 50 years under the PAP? We know that the PAP won’t suddenly change its spots. The PAP is not going to change. It wants a 10 million population in Singapore. The Old Guards have gone. The PAP we used to know have died. There is no point hanging on to the PAP, not when the PAP has moved on from Singaporeans. Plainly put, you either change the government or you don’t. You either have policies to protect Singaporeans or you don’t. 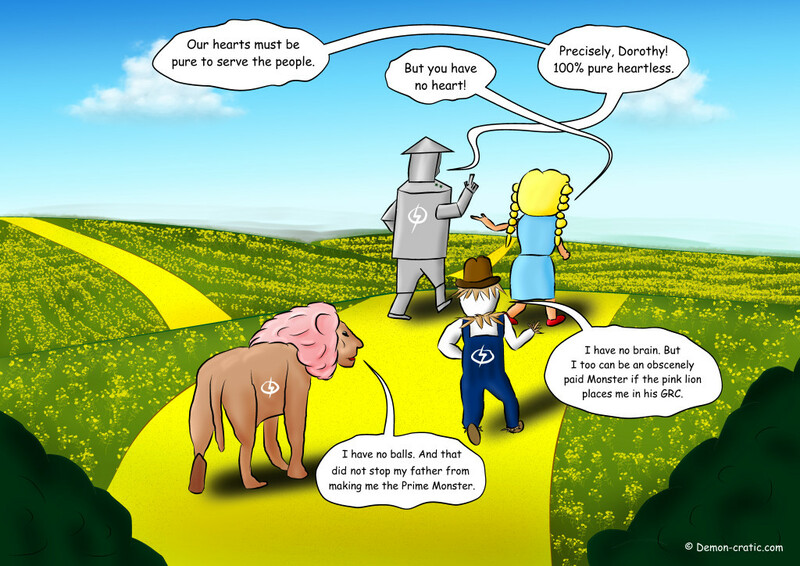 So, you have to make a choice. What’s yours? The reality is, only the opposition will implement policies to protect Singaporeans. So, you decide. Do you want to continue under the PAP which wants to keep making money off you, or do you want a new government which will protect you? You decide. Now, to be clear, when a new government comes on board, it’s not going to be smooth sailing, because first the PAP will definitely sabotage the new government and second, it will take the new government several years to try to undo the bad policies that the PAP has done. You can bet that the PAP will do what it can to make the new government look bad, so that it can win back government at the next election after, and continue its policies of making money off Singaporeans. So, the question is, are you willing to be patient with the new government? Or will you fall for the PAP’s trickery? Of course, there is another alternative. The other alternative is to stick with the PAP. But the thing is, things will also not be smooth sailing either. You have seen for yourself how Singapore has been going for the last 5 to 10 years. Wages have been depressed, productivity have gone into the negative, the PAP is stuck on how to reverse some things and yet it is not bold enough to change things, too scared to rock its own boat, and what about the cronies it is trying to feed? So, how will all this end? Well, collapse. Ironically, the very collapse the PAP wants to scare Singaporeans into believing, is what will happen if we continue under the PAP. So, really, it’s up to you. What do you want? And what do you want to believe in? It’s all in your hands now. Are you ready for change? Well, I am. And when change happens, at least I can work with the new government to make things better. At least I will have a voice. And at least I will have a say, not like now where the PAP can persecute you just for speaking up. So, you choose. Finally, some speak of a coalition government. Yes, this is what I look forward to as well – a coalition made up of the opposition parties, to form a new government. How will this happen? The opposition will be meeting this Friday to discuss which constituencies to run in. Well, yes, they need to. As much as I believe in democracy, Singapore is at a transitionary stage. Simply, the situation is unfair right now – the PAP has made it unfair, and an unequal playing field. We need to be strategic, if we want change to happen. We cannot let it be random. The opposition will have to discuss to prevent three-corner fights. Anyone who enters into a three-corner fight is likely a mole and should be written off. You should not vote for this person. Singaporeans also need to be strategic. We need to vote to bring the opposition into the government, to form a new government which will implement policies to protect us. What does this mean? This mean that we need to look broadly at the election, and at the electoral boundaries, to see how we should vote, to have the majority government we want. Once enough opposition parties are voted into government, they would be able to form a coalition government. 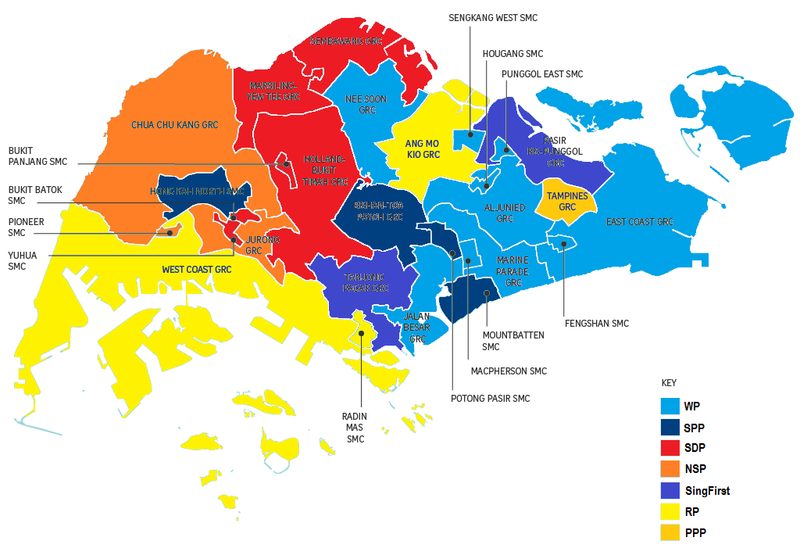 In short, vote for the constituencies where the Opposition have already won and the constituencies where the Opposition won more than 40% of the votes at the last election – the PAP has calculated that they are likely to lose another 10% of the votes at this coming election and over the past three elections, in constituencies where the boundaries did not change, the Opposition has also gained by an average of 10% at each election. Thus the constituencies where the Opposition has won more than 40% of the votes at the last election are likely where they can win. To make up enough numbers for a two-thirds majority government led by the Opposition, you would also need to vote for constituencies where the Opposition won more than 35% of the votes at the last election. This way, the Opposition will win 63 seats (70.1% of the seats) and be able to form a new coalition government which will then be able to implement new policies to finally protect Singaporeans. And do you know what’s good about this new government? You get to keep the PAP ministers who oversee the financial aspects of Singapore and the economy – Finance Minister Tharman Shanmugaratnam, Minister for Trade and Industry Lim Hng Kiang, Second Minister for Trade and Industry S Iswaran. The rest of the other PAP ministers are pretty much redundant, really. You actually get to have your cake and eat it. A Spoilt Vote is Loss for Singapore. Don’t Spoil Your Vote. And one last note, if you intent to spoil your vote, please think again. If you spoil your vote, the PAP can take your spoilt vote as a vote for themselves. Also, let me share with you what the larger implications of you doing so are. When you spoil your vote, you are potentially letting the PAP win one more vote. You are letting the opposition lose one more vote. If the PAP still gets a seat and have enough to form the government, it will continue to create policies to hurt Singaporeans – and that means you. This means you still will still be adversely affected. So, we cannot choose to don’t care anymore. Your vote matters. So, you have to understand that spoiling your vote is not just about you making a statement. No one knows what statement you are making. Only you will know it yourself. And the PAP gets your vote. It’s pointless. You want to make a statement, Vote Opposition. Change our future. So, before we make the vote, it’s not about what we personally think or how we personally feel about one particular candidate. In Singapore, at this point in time, it is about being strategic. It is about what we want for Singapore, how we want to get there, and how we should then vote. I have tried to outline this for you in this article, so hopefully we can digest this a bit, think about the government that we want, and decide how we should vote to get there. For me, I would go for a the third scenario, a two-thirds majority made up of the opposition parties, to form a new government. For me, there’s no two ways about it. We either continue to let the PAP keep hurting Singaporeans, or we vote for a new government with the power to change things for the better. So, what will you do? It’s time for change, don’t you think? If you have decided, then vote decisively for change, so that we can protect ourselves, our children, and our future generations. So that we can protect Singapore. U have to be more specific in stating “each year” the evil PAP regime handout over S$400million to foreigners studying here in the form of scholarship grants/etc. Whereas Singapore citizen students are only given miserable amount of bursaries or few get to be awarded scholarship, and also only those related to PAP. Singaporeans are getting more than 70% subsidy… on top of that, the top students were given scholarships and the poor students given bursaries…. getting smart ppl to study in sg will spur singaporeans students further…this is very good as it allows us to understand what global competition is… else the smart singaporeans will think a world of themselves… sg is very small, even 10% of our brightest is not 0.0001% of the talented ppl around the world…. hidding behind your mummy’s apron will not help u… Singaporeans are meant to be global citizens and take on the world. hi ted, competition is a bad word. there is ppl always more talented than us. we can’t always put ourselves in the disadvantage situation for the sake of competition. with your mindset, you should give up your job to someone more capable than you, give up your wife to someone richer than you, etc. there is no end to it. one day when you needed the help most and yet the garmen extends their help to someone else, then you will know how idiotic and stupid you are. Human beings strive to improve itself. Even animals learn from their mistakes. Competition will bring about progress and advancement. Learning from the best will improve our children. By disallowing competition, Are u not even on par with cats and dogs? Can you provide your photo, nric, full name, and company (since you always insist on the abovementioned for online commentators, otherwise you call them no balls), so that we know if you are affiliated to pap? But he never defame anyone, why should Ted give anything to u? Since some ppl want to say PAP is corrupt then why not prove it… I would love to see PM lee in court if someone can give such evidence… Why keep saying such things when u dun have any thing to show? 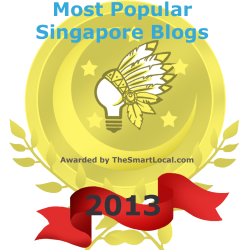 Now all we have to do is to send this article to as many Singaporeans as possible. Even if 10% of them were to read it, it would be enough of a swing to get the necessary effect that we are looking for. I vote to merge with Malaysia back. Isnt LKY PAL made a mistake by not giving in？we should undo it now. Umno. Hi, don’t worry. Roy scenario will send Singapore merging with Malaysia soon. It is almost a certainty that the top leader of Malaysia is corrupt and is abusing his power to sue unjustifiably and to sack his deputies, just to avoid being investigated and accounted for. The people of Malaysia watched in dismay, yet nothing can be done to the top leader. He can do whatever he wants (including murder) and still get away scot free. If this can happen in Malaysia, surely it can also happen in other countries including Singapore. What safeguards are there in place such that if the very top leader is corrupt, or seemingly so, he or she can be held accountable without fear of reprisal or biases? The solution is to vote in more oppositions into the parliament to provide the necessary check and balance on the government. Malaysia got no opposition? Only one dominant party? Vote out the monkeys and vote in the donkeys? Or demolish the house and usher in a new millennium of peace? UK and all democratic govts around the world re-draw election boundary … u mean that ROY is better than these democratic countries put together? 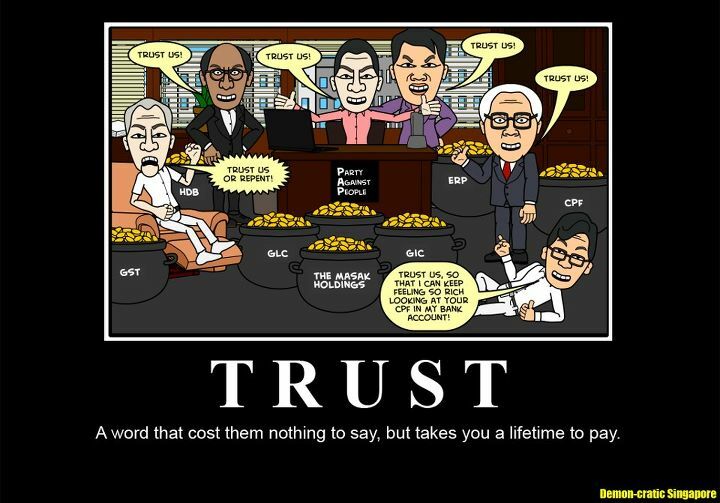 If the PM didn’t do anything wrong… Why would anyone want to trust a crook like Roy Nerng? So did PM Lee invest our CPF into temasek holdings? U don’t know meh. .this Roy is special..he know everything..he can be in charge of any ministry and can stamp out poverty..but put him under pressure he will cry one..hahaha hahaha! hi ted, are you sure pm did nothing wrong? check with him if he dare to open up the cpf account for audit. hi jackfruit, roy does have the material to be someone greater than you thot. crying does not make him a lesser man. lky also cried right. if roy would stand for election, pap will wet their pants. have it crossed your mind why pm tried very hard to bankrupt roy? Hi* jackfruit, Roy* does have the capacity* to be someone greater than you think*. Crying* does not make him less than a man*. LKY* cried too*. If* Roy were to stand* for election, PAP* will wet their pants. Has* it crossed your mind why our* PM* tried so* hard to bankrupt Roy*? Strange thing to say… Roy was given all the time in court and he said our PM is not corrupt and he is a trustworthy PM. U must be wondering at school too; no wonder so stupid. SDP and SPP or SFP managed to secure some GRCs, WP will win close to 20 for a combine of about 30 seats, the pappies will be forced to look within themselves and LSL position will dire and forced to handover to his DPM. Sinkies may be daft and kiasi but they are also realistic and kiasu. Trust in Roy’s prediction. Trust in his poll results. How come students in s’pore have not been learning the true form of our Constitution, but rather the watered down version? [POLL] GE2015: Will You Vote Opposition or PAP for Singapore’s Future?